I had wanted to make a weekend visit to the Sierra Foothills wine country for awhile, as it had been a couple of years since I'd been there. An opportunity to do that finally came up and I headed out of town the Saturday preceding the Fourth of July. Since the timing was uncertain until shortly before I left, the only advance winery arrangements I made were with Cedarville Vineyard - other stops were just regular tasting room visits. I was on my own on Saturday, and made plans to meet up with several friends for more wine touring on Sunday. Convergence Vineyards: Leaving Oakland on Saturday morning, I drove about two hours to the Amador County wine country, where my first stop was at Convergence Vineyards, a new winery just west of the town of Plymouth. Steve and Jamie Concannon bought land here (at the convergence of three creeks) in 2002, and commuted weekly from Napa until they moved to their new property this past April. Their tasting room opened in February. While their own vines mature, they’re using mostly purchased fruit for their wines, which I thought were quite promising. They’re currently producing less than a thousand cases per year, but hoping to ramp up to their goal of around three thousand. Wines include a Viognier, Mourvedre, Barbera, Zin, Syrah, Petite Sirah, and Port, all very reasonably-priced. The ‘02 Mourvedre, ’02 Syrah, and ’03 Petite in particular were very good but I thought the ’03 Barbera (from Lodi fruit) was the star of their lineup. If they can continue to produce wines of this quality, this could be a winery to watch. Nua Dair: Next up was Nua Dair, just a couple of miles away. This was my first visit to this winery, and they were pouring a Sauvignon Blanc, Sangiovese, Zin, and Cab. I thought the wines were pleasant but not particularly noteworthy. To be fair, they were sold out of the wine they seem to be best-known for – a Super-Tuscan style blend called “Banais”. Casatierra Vineyard: After picking up some lunch supplies from the Pokerville Market in Plymouth, I headed a short distance east to the Fiddletown area to visit Casatierra Vineyard, where Sasha Verhage purchases some Syrah fruit for Eno Wines. Located on a south-facing slope, Casatierra overlooks the historic Eschen vineyard in the bowl-shaped valley below. 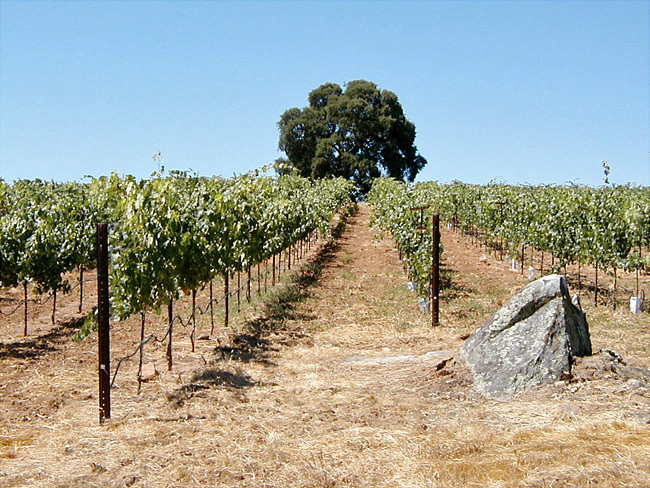 The decomposed granite and volcanic soil at Casatierra is not quite as flaming red as the valley soil, and features several small granite rock outcroppings among the vines. George and Pam York purchased the property in the '80s, and shortly thereafter they built a rammed-earth house (or "casa tierra") high on the slope. They began planting the vineyard in the late '90s, and using the advice of famed local winemaker Scott Harvey (who also sources fruit from the vineyard), they continued their planting into the early '00s. They now have seven Syrah clones planted - 99, 174, 300, 383, 877, Hermitage, and 477. The vines looked healthy and the bright green clusters looked very good. The walk back up the hill to my car was hot, but not too bad. I learned that I had lucked out with the weather – it was about 90 degrees in the Amador wine country the day I visited, while the weekend before had been about 105! Sobon Estate: Continuing north from the Fiddletown area, I soon reached Sobon Estate. Started in 1989 by the Sobon family, who also own nearby Shenandoah Vineyards, the winery is located in the premises of the historic D'Agostini Winery, one of the oldest in Amador County. The tasting room has a wonderful museum adjacent to it, featuring old winery and farming implements. As I'd visited the museum several times before, I headed straight to the tasting room this time. The ’05 Viognier (which has some Roussanne blended in), from their own organic vineyards, was the best white I’ve tasted from Sobon – slightly floral and stone fruit aromas, crisp acidity, very nice! The '05 Roussanne and '05 Rosé (mostly from Grenache) were not as interesting, but the ’04 Rocky Top and ’04 Fiddletown Zinfandels, both from old vines, were very good. Both were fairly tannic but with loads of classic Amador Zin fruit. The Fiddletown was the riper and richer of the two. I finished off the tasting with a very pleasant '04 Orange Muscat dessert wine, medium-bodied and fairly sweet (11% residual sugar), but not overly so. Dobra Zemlja: From Sobon, I headed back a couple of miles to the southwest and into the heart of Amador wine country, Shenandoah Valley. Stopping for a picnic lunch at Dobra Zemlja Winery (that’s “Good Earth” in Croatian), I tried a few wines at their tasting room. I’ve liked some of their wines in the past, but I think my palate has changed somewhat over the years and their wines just aren’t what I’m looking for these days. They’re unquestionably popular, though, and if you like very big, rich wines and don’t mind a healthy dose of American oak, Dobra Zemlja is worth checking out. Domaine de la Terre Rouge / Easton: Just a couple of miles further down the road, my next stop was an old favorite, Domaine de la Terre Rouge / Easton Wines. Terre Rouge consistently makes some of the best Rhône-style wines in the Sierra Foothills, while Easton is known for fine Zinfandels, made in a more restrained style than most from Amador County. The ’04 Vin Gris d’Amador was very crisp and refreshing, made from 51% Mourvedre, 34% Grenache, and 15% Syrah. The ’04 “Enigma” white wine was excellent, a blend of 54% Marsanne, 23% Viognier, and 23% Roussanne. Harvested from a 3,000-foot elevation vineyard and fermented in older French oak barrels, this was one of the best whites I tasted during the weekend. The aroma reminded me of apricots, with just a hint of flowers, and the palate had a great combination of richness with good acidity. The ’02 "Tête-à-Tête" is a lighter-styled GSM blend for everyday drinking – very pleasant, with strawberry aromas dominating, a great value wine. I really liked the ’00 Sierra Foothills Syrah. A combination of younger-vine fruit from higher-altitude vineyards blended with lower-altitude Amador fruit to add richness, this had a smooth mouthfeel, with complex aromas of olives, pepper, and grilled meat. The ’02 “High Slopes” Syrah, a blend from two higher-elevation vineyards, was richer, more tannic, and spicy. A couple of Easton Zinfandels completed the tasting. The ’01 Estate had very nice berry aromas and a touch of pepper, while the ’01 Fiddletown Zin (from the 140 year-old Eschen-Rinaldi vineyard) was noticeably bigger and riper. Overall an impressive lineup, always one of the best in the Foothills. Vino Noceto: Back toward the main road from Terre Rouge is Vino Noceto, which specializes in Sangiovese and does a fine job with it – I think they make some of the best in California. Most of their vines date from the late ‘80s and early ‘90s, while a more recent planting was added in 1999. One wine I’ve enjoyed in the past but which they didn’t have available for tasting when I visited is their “Frivolo”, a frizzante style Moscato Bianco. I started out at the tasting room with the ’05 Rosato di Sangiovese. Light color and body, but very flavorful and refreshing, and only 12% alcohol – a perfect summer wine! Vino Noceto makes a number of Sangioveses, and it was a pleasure to taste through them. Their ’03 Noceto Sangiovese is the lightest of the offerings, but it’s got plenty of bright cherry flavor – should be a nice pizza wine. The ’03 Riserva was my favorite, deeper and richer, with a light touch of spicy oak and good acidity. This one had the stuffing to put away for several years. The next two wines came from specific estate vineyard blocks. I thought the ’03 Dos Oakies Sangiovese was similar to the Riserva but without quite the depth of flavors, and the ’03 Hillside was the biggest and most tannic of the bunch, and featured more sweet oak than the others. I also tasted a Zin, from the Original Grandpere vineyard – very nice, ripe fruit but not over-the-top. I couldn’t leave without taking a photo of their Doggie Diner head, relocated closer to the winery and nicely repainted since my last visit. Reminded me of all the long-gone Doggie Diners of the Bay Area. Story Winery: Before leaving the Shenandoah Valley, I stopped at two other wineries I’d never visited before – Story Winery and Cooper Vineyards. Longtime Zin specialist Story was pouring a number of Zinfandels at their tasting room, many of them from the older vineyards that Amador County is known for. 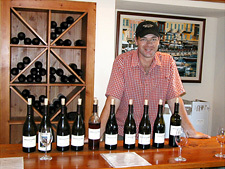 Overall, none of the wines did much for me – they were all quite big and ripe, a couple with noticeable alcoholic heat. Cooper Vineyards: I headed on to Cooper Vineyards, long-time growers but only recently producing their own wines, and with a tasting room that had only been open for about 18 months. Overall the wines were good but unremarkable – I thought a bit too much oak masked the varietal character in several cases. If you like really big reds, though, their ’04 Alicante Bouschet might be just the ticket – super dark and tannic! Fleur de Lys: Leaving Amador County by mid-afternoon, I drove north along Mt. Aukum Road and into El Dorado County. A number of wineries are clustered near the tiny towns of Somerset and Fair Play, and I thought I’d stop at two or three places before meeting some friends for dinner. First stop was Fleur de Lys, which was pouring Chardonnay, Viognier, Grenache Rosé, Zin, and Syrah. I’d been introduced to this winery a few years ago by “Backroad” Bob Summers. One thing I learned at that time is that their production is so tiny that they run out of some of their better wines quickly, so you never know what they’ll be pouring at the tasting room. I didn’t find any of the wines I tasted on this visit to be exceptional, though all were well-made and enjoyable. Worth checking back there next time I’m in the area to find out what they’ll be pouring then! Winery by the Creek: Next stop was a new winery in the small town of Fair Play. Winery by the Creek was named, no doubt, for the creek flowing directly adjacent to the winery. They feature a sizable wine cave, and a wide variety of wines – too wide, perhaps, as I found the quality to be varying, and none of the wines I tasted were really noteworthy. Maybe a bit more focus might be beneficial here, particularly for a new winery. Granite Springs Winery: Last stop of the day was Granite Springs Winery, not far from Fair Play. My first visit there, it is one of the better-known wineries in the area, and the tasting room was hopping that day. I tasted their "Sierra Reserve Red" (an unusual blend of Merlot, Cab, Petite Sirah, Syrah, and Black Muscat), Syrah, Petite Sirah, and two Zinfandels. All were nice, and they all displayed good varietal character as well as sharing distinct spicy overtones in their flavors. The two Zinfandels - the ’03 Estate and ’04 La Falda - were big wines, but seemed restrained in comparison to the riper fruit displayed in many of the Amador Zinfandels I tasted earlier in the day. After doing some backtracking to meet a couple of old friends for dinner, I drove to Placerville to spend the night. Next morning, I drove along Carson Road just north of town, through the Apple Hill area. 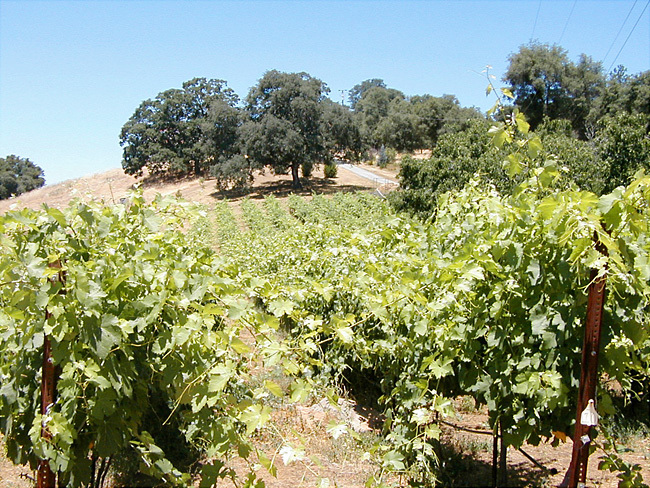 This region contains some of the highest-altitude vineyards in California. There are several notable wineries in the area, including Boeger, Lava Cap, and Madroña. I didn’t have time to stop in at any of these on this trip, but I stopped briefly at Boa Vista, one of the many apple farms along the road. During the fall harvest season, the Apple Hill area is a very popular destination for many people looking to sample and buy a wide variety of apples, juice and cider, pies, and other goodies. As Sunday was hotter than the previous day, I was glad to be in the slightly cooler air of the higher-altitude El Dorado County wine region. 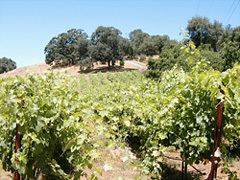 In contrast to the grassy hills dotted with oaks and other trees that are prevalent in Amador, the vineyards in El Dorado are often surrounded by conifer forests. Holly’s Hill Vineyards: First stop of the day was at Holly’s Hill Vineyards, where I met several friends who joined me for the day. Behind the tasting bar was Josh Bendick, who shares the winemaking and sales duties with his wife Carrie (Holly is Carrie’s mother). The tasting room is located adjacent to the winery’s estate vineyard, and the back deck has an exceptional view – we were able to spot Mount Diablo, over 85 miles away across the Central Valley. The wines are made from both purchased and estate fruit. 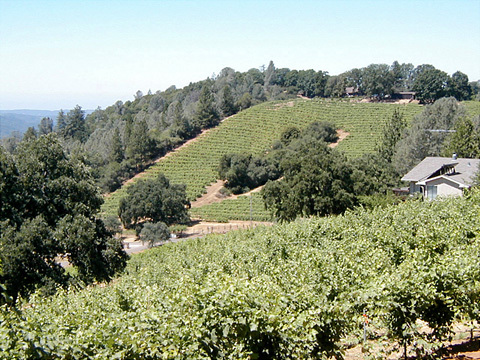 At an altitude of about 2,600 feet, their hillside vineyards, adjacent to the winery, are considerably higher that those in Amador County to the south. Holly's Hill grows a variety of Rhône grape varieties, including Syrah, Mourvedre, Counoise, Grenache Blanc, Roussanne, and Viognier. First planted in 1998, the older vines are on quadrilateral trellising, while more recent plantings of red varieties are head-trained. I’m seeing more and more head-trained Rhône grape vineyards in California, as growers emulate the vineyards of the Rhône valley itself. We started our tasting at Holly’s Hill with a ’05 Roussanne, very nice citrus aromas and rich mouthfeel. All of their white wines are barrel-fermented in older oak, with no malolactic fermentation. The next wine was the ’04 "Patriarche Blanc", a blend of 72% Roussanne and 28% Viognier, all estate fruit. A serious Rhône-style white blend, this was delicious and should age nicely. Their ’04 "Tranquille Blanc", which reverses the percentages of Roussanne and Viognier, is a lighter blend in which the Viognier’s floral and peach aromas come to the fore. The ’04 Chardonnay uses somewhat newer oak, which was noticeable but not overdone. Next up was the ’04 Grenache Rosé, made from 1/3 saignée and 2/3 whole-cluster press, then barrel-fermented with no malolactic as with the white wines. A very pleasant medium-bodied Rosé, it displayed floral and strawberry aromas, with a touch of citrus in the flavors. The ’04 Grenache has 5% Syrah co-fermented and 4% Mourvedre blended in – a lighter red with strawberry aromas and mild tannins. The ’04 "Tranquille" is a Grenache-based Côtes du Rhône style blend, fairly light-bodied with some herbal notes and a spicy finish. The first of two Syrahs turned out to be my favorite wine of the Holly’s Hill lineup, and probably my favorite red wine of the weekend – the ’04 Wylie-Fenaughty Syrah. A blend from two higher-altitude vineyards a bit farther north in El Dorado County, this wine had aromas of blackberry and herbs, and showed wonderful depth on the palate. Not overly tannic, but deserving of at least several years of aging – a great example of the kind of wines the Sierra Foothills are capable of producing. The final three wines were all good, but somewhat anti-climactic after the Wylie-Fenaughty. The ’03 Hill Top Syrah, from estate fruit, showed more oak than most of the wines (overall Holly’s Hill does a terrific job of providing just the right touch of oak on their wines), and had a dark berry and herbal character. The ’03 Zin was fairly ripe and a bit jammy, and the final wine of the tasting, the ’05 Late Harvest Viognier, was quite crisp and refreshing, just 4.4% residual sugar. Holly’s Hill is just celebrating their fifth year in business, but they’ve quickly become one of the best producers of Rhône-style wines in the Sierra Foothills. Sierra Vista Winery: Heading out of the Holly’s Hill driveway, we immediately turned up the entry road to Sierra Vista Winery, among El Dorado County’s best producers for a number of years. The shaded picnic area in front of the tasting room is one of the most scenic anywhere, with a spectacular view over the vineyards to aptly-named Pyramid Peak and the Crystal Range of the Sierra Nevada, towering nearly 10,000 feet high in the distance. In the heat of summer, a shady spot like this is a perfect place to relax for awhile, so it was no surprise that we were joined there by Rocky, one of the winery cats. Rocky gained fame earlier this year by taking center-stage in a couple of photos featured in a San Francisco Chronicle article about Rhône-style wine producers in the Sierra Foothills. Sierra Vista is known for a variety of different wines, not just Rhônes, and we began our tasting there with an ’05 Fume Blanc. Fermented in stainless steel, this was delicious, with citrus and melon aromas, and a great balance of richness and acidity on the palate – outstanding! The ’04 Roussanne was also stainless steel-fermented, and aged in newer oak. It displayed mineral notes and a rich mouthfeel. The ’04 Viognier was a bit oakier than I would have preferred, but still carried some floral aromas and tropical fruit flavor. The ’04 "Belle Rose" is a Grenache Rosé, very pretty color, showing berry and citrus flavors. We tasted through a number of Syrahs and Zinfandels, the best of which were the ’04 La Grande Syrah (all from Clone 1 fruit), a moderately big wine with dark berry and pepper notes and medium tannins, and the ’04 Reeves Vineyard Zinfandel, very big and rich with some sweetness to the fruit but without seeming over-ripe. We finished with an ’02 Cabernet and finally the ’04 Viognier Doux, a somewhat sweeter and richer style of Viognier dessert wine than the Holly’s Hill version. While some of the newer players on the scene generate more press these days, Sierra Vista continues to produce very good and well-priced wines year after year. Cedarville Vineyard: After a brief picnic lunch at Sierra Vista, we drove south to the Fair Play area, where we had an appointment at Cedarville Vineyard. We were welcomed there by Jonathan Lachs and Susan Marks. 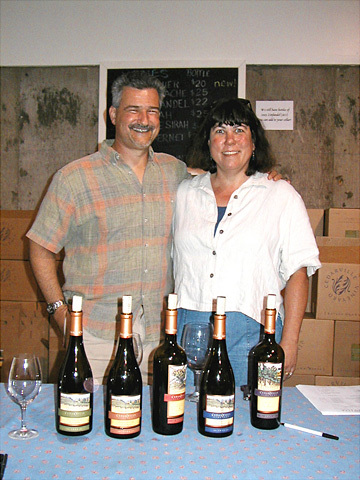 Jonathan and Susan met while attending the UC Davis Enology program. They purchased the vineyard land in the mid-'90s and started planting it shortly thereafter, finally moving there full-time in 1999. Their meticulously-farmed 15-acre estate vineyard, mostly with decomposed granite soil, is at an elevation of about 2,500 feet. We started our tasting by heading into Cedarville's wine caves, built into the hillside using arched precast concrete panels. I've participated in some marathon barrel-tasting sessions with Jonathan and Susan in the past, but since we were both short on time on this visit, Jonathan decided to focus the barrel tasting with samples of three wines to be bottled shortly after our visit and released later this year. The ’04 Syrah (with 6% Viognier), was a blend from the top, east, and north vineyard blocks. Sweet blackberry fruit and spice predominate, and the tannins are well-tamed (always an issue with mountain-grown fruit). The ’04 Cabernet Sauvignon was made with a 30-day maceration to help moderate the tannins. A rich wine with intense cassis and chocolate aromas, the tannins are big but not harsh. Cedarville's Cabs keep improving – earlier ones seemed fairly lean, while more recent ones are more full-bodied with more upfront fruit, yet still nicely-structured. We finished our barrel tasting with the ’04 Petite Sirah. Cedarville's only non-estate wine, the fruit comes from 25-30 year old vines from the nearby Naylor vineyard. Tasted from an American oak barrel, this wine is very big, with deep berry aromas plus vanilla overtones from the barrel. Although the tannins can't be ignored, they are not bitter or astringent. Leaving the wine caves, we stepped up to the small tasting table in the corner of the winery to taste the current releases. The newly-released ’05 Viognier is ripe and viscous, and Jonathan noted that this vintage shows the distinctive Viognier aromatics better when still chilled than earlier vintages did. Even straight from the refrigerator, the stone fruit, citrus and lightly floral aromas were clearly in evidence. The evolution of Cedarville's Grenache as the vines mature has been fascinating. The first vintages were lighter, pleasant wines with strawberry-like fruit. By comparison, the ’04 Grenache is distinctly bigger, with darker fruit character. The addition of about 12% Syrah adds some backbone to the wine, which was more tannic and ageworthy than earlier vintages. The ’04 Zinfandel shows considerable ripeness but it's not over the top - the fruit character was blackberry rather than over-ripe raisin or prune. There's great depth of fruit in the Cedarville Zin, and no evidence of heat despite alcohol well over 15%. The ’03 Syrah (co-fermented with 3% Viognier), spent longer in barrel than usual, about 21 months. This wine displayed blackberry and coffee aromas and flavors with herbal and pepper notes - a very rich, full-bodied wine, and fairly tannic. The ’03 Cabernet Sauvignon is rich, spicy and with medium tannins, their best yet (well, at least until that '04 is released!). Cedarville continues to produce some of the most impressive wines coming from the Sierra Foothills. We said goodbye to Jonathan and Susan – as always, their hospitality is right at the top of the list among all the wineries I've visited over the years. Mount Aukum Winery: Driving just a few miles south of the Fair Play area, we turned off at the road leading to Mount Aukum Winery. The winery is located near the very top of Mount Aukum, which has a commanding view in all directions. I’d visited the winery once before, shortly after it opened a couple of years ago, and I was impressed by several of their wines, in particular their Petite Sirah. On this visit, the tasting room was packed, but we managed to squeeze in at the very end of the bar. The winery produces quite a few different wines, but their main focus seems to be Rhône varieties, plus Zin and Cab, not unlike Sierra Vista. We tasted two different Rhône-style white blends, the ’04 "Destinee De Blanc" (wasn’t that an album by the Police?) – 40% Marsanne, 30% each Roussanne and Viognier, and ’05 “4 of a Kind”, 33% Viognier, 25% Marsanne, 28% Roussanne, and 14% Grenache Blanc. The first was pleasant, crisp, and slightly floral, while the “4 of a Kind” displayed more upfront peach and tropical fruit flavors. The ’05 Viognier and ’05 Marsanne were not particularly noteworthy. Moving on to reds, the ’04 Mourvedre (from Paso Robles fruit) was ripe, sweet, and mellow – pleasant but not what I would expect from Mourvedre. The ’03 El Dorado Zinfandel was very good, spicy and somewhat tannic. The ’04 Russian River Zin was a bit sweeter but not over-ripe, and smoother than its El Dorado cousin. Last up was the ’04 Fair Play Petite Sirah, and as with my earlier visit I thought this was the standout of the lineup. Very dark, an almost blue-purple color, this had concentrated blackberry aromas and flavors with a touch of sweet oak. The tannins were substantial but not overly harsh. I got the sense that this relatively new winery is still trying to find its direction, but there’s enough promise in the wines to suggest that they may become one of the better wineries in the region before long. Narrow Gate: Last winery stop of the weekend was Narrow Gate, just a few miles from Sierra Vista and Holly's Hill. 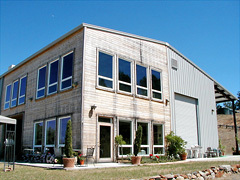 One of the newer wineries in the area, the estate vineyards are in their sixth year, and the winery opened their tasting room just a couple of years ago. Narrow Gate's whites & Rosé are all barrel-fermented, with no malolactic fermentation and with frequent lees stirring. The ’05 Chardonnay (whole-cluster pressed) featured mild tropical fruit aromas & flavors, with a rich mouthfeel. The ’05 Viognier-Roussanne blend was lighter-bodied, with citrus aromas and crisp acidity. The ’05 Côtes Rosé, a saignée from 95% Grenache and 5% Syrah, was light and refreshing. The ’04 Zinfandel, using 100% American oak, was a lighter, more elegant style than most I tasted during the weekend - very nice. The ’03 Syrah was also quite good, reminding me somewhat of Cedarville’s version. I preferred the '04 Cab-Syrah blend (50% each) to a similar wine we tasted at Sierra Vista earlier in the day. I find that many times the Cabernet and Syrah flavors tend to compete in such blends, but in this wine the flavors combined seamlessly. The ’04 "Dunamis" (Chateauneuf du Pape-style blend of 67% Grenache, 25% Syrah, and 8% Mourvedre) was the best wine of Narrow Gate's lineup and among the best reds of the weekend. Dark berry aromas were joined by spicy notes in the flavors, with a rich mouthfeel and moderate tannins. The wines at Narrow Gate were very nice across the board, and show promise for even better things to come as the estate vines mature. Leaving the Foothills and heading home late Sunday afternoon, we stopped for dinner at the Sudwerk brewpub in Davis. Specializing in hearty German food and featuring a good variety of year-round and seasonal beers, it's a perfect location just about halfway back to the Bay Area from the Sierra Foothill wineries. Dining on the shady outdoor patio was a very enjoyable way to wind down the weekend trip. The wineries of the Sierra Foothills remain one of California’s best-kept secrets. Fortunately for those of us doing wine touring there, the relative lack of exposure for these wineries means that wine prices are lower, and often significantly lower, than you’ll find in most other California wine regions. Wine quality in the area is rising faster than prices, and it’s not hard to find some real bargains coming from these wineries. Another nice benefit is the absence of tasting fees. 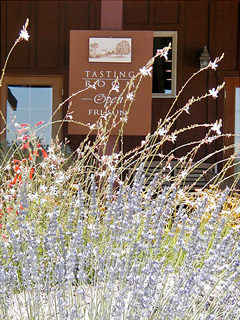 Not one winery I visited over the weekend charged a tasting fee – I can’t remember the last time I experienced that! And with a number of friendly smaller wineries, where you stand a good chance of meeting the winemaker pouring for you at the tasting bar, it becomes a great area for a weekend wine getaway. As always, thanks to everyone that my friends and I visited for being so generous with their time and their wine!